This is the third place winner in the 2017 Narrative Map College Student Writing Contest. As a teenager, I cringed at the idea of staying in Battle Creek. I looked down on the people who grew up in Battle Creek, raised their own families in Battle Creek, and sent their kids to the same schools in Battle Creek. I was determined to be different than all of them. I wasn’t going to get stuck in in this place; instead, I was going to depart for college and leave for good, pile my belongings into my tiny blue Saturn, and fly down I-94, never to look back. Really, the city could burn for all I cared, because in my escape of Battle Creek I thought I left a wasteland. I thought I left the rundown buildings, the pathetic mall, the potholed roads. But that’s not all I left. My friends and I compete with each other, trying to see who can name what type of cereal Kellogg’s is making. The air is sticky and thick with grainy starch and sickly sweet sugar. The first person to recognize this wonderful scent shouts, “Frosted Flakes!” And then, of course, we all pine for a heaping bowl of the stuff; but mouths watering, the taste of the air will have to do. Every year, Battle Creek becomes a launching pad for hot air balloons and their pilots. There are always balloons like Tony the Tiger, Sugar Bear, Post, and others made up of checkered and striped patterns. It’s a tradition for my dad, brother, and I to get into the car and drive to the balloon launch. We always get there early, eager with anticipation. Sometimes, we even wait an entire hour to see the balloons slowly ascend into the sky. Once they finally launch, we pick a balloon we really like, and we “chase it.” With my dad behind the wheel, we follow Tony the Tiger in the car until it lands. This task is more difficult than it sounds. 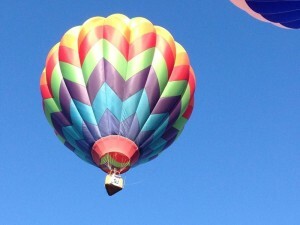 We often get stuck in traffic or take a wrong turn until our balloon is out of sight. Then, we race down back roads until we find it again. Once our balloon lands—in a park, in a parking lot, in someone’s backyard—we “land” there too. This is my favorite part because I get to meet the pilot, who is basically a celebrity to me. He gives me a card that has a picture of the balloon on it, and he signs it. Before we leave, we help the pilot pack up the balloon. When we get home, I place the card with the rest of the thick stash I keep hidden under my bed. These memories continually draw me back to a place I once refused to call home. There’s a reason people use clichés; they’re often true. You never know what you’ve got until it’s gone. April Kragt is originally from Battle Creek. She is currently an English major at Spring Arbor University, where she tutors in the Writing Center and has been published in the campus literary journal, the Oak Tree Review.